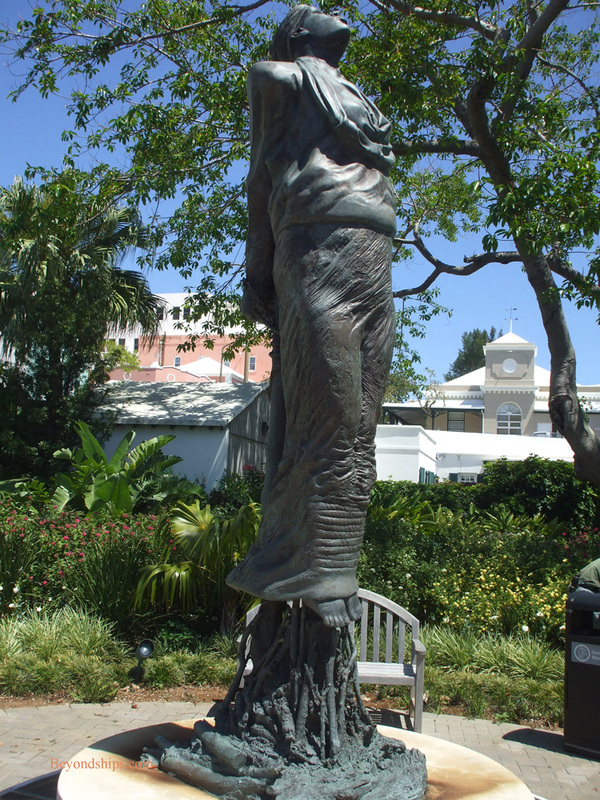 Above: A recreation of the Deliverance in St. George. 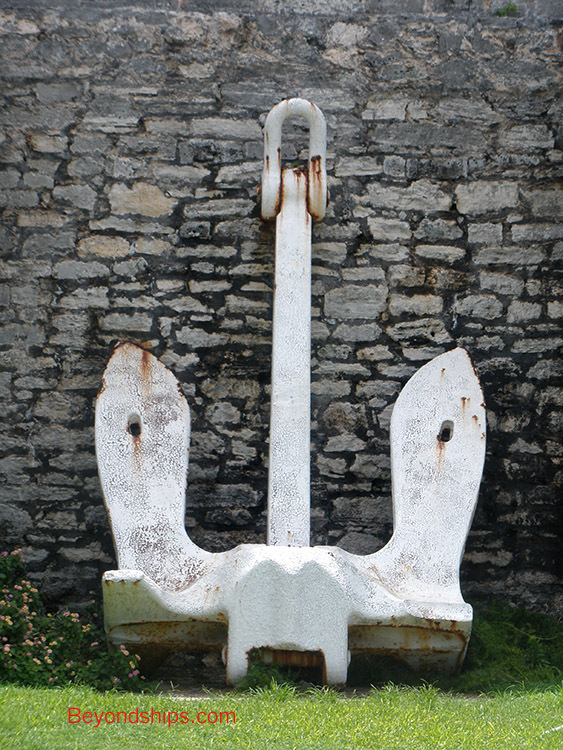 Below: A ship's anchor is one of the many artifacts on display in the Royal Naval Dockyard. 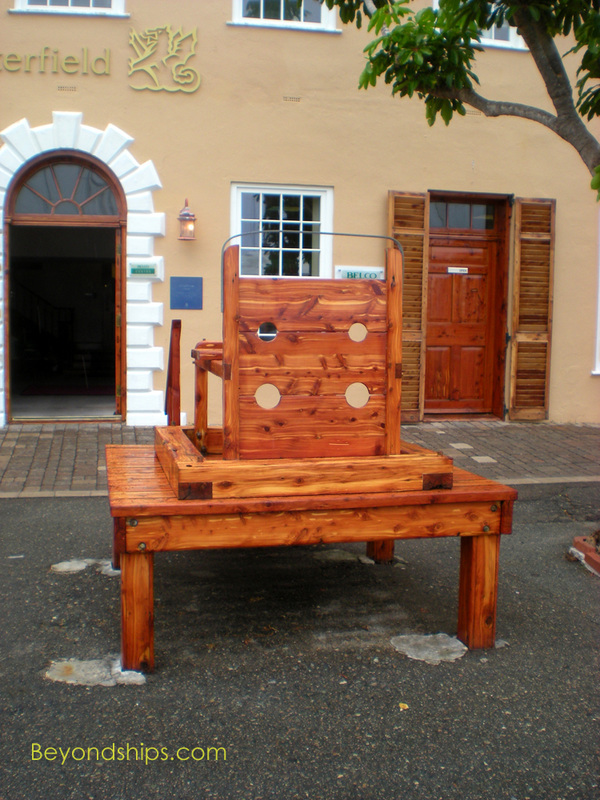 Below: A reproduction of the stocks once used to punish lawbreakers and other annoying people in St. George. In 1609, the British colony at Jamestown, Virginia was nearing collapse. In order to protect their investment in that colony, investors in the Virginian Company dispatched a nine-ship rescue fleet to save Jamestown. However, during their transatlantic crossing, the fleet encountered a hurricane that dispersed the fleet and which caused the flagship, the Sea Venture, to founder on a forgotten group of uninhabited islands. These islands had first been discovered by Spanish explorer Juan Bermudez in 1505 but no attempt to colonize them had been made. There was no loss of life in the wreck of the Sea Venture. During the next ten months, the survivors built a new ship, Deliverance, out of what they could salvage from the old ship and a new ship, Patience, out of what they could find on the islands. While the islands had little in the way of fresh water, they were tranquil and provided enough food for survival. Accordingly, their leader Admiral Sir George Somers, claimed the islands for England. When the new ships were completed, all but two of the Sea Venture survivors sailed on to Virginia. (The two were left behind primarily to maintain England’s claim to the islands). Bermuda on July 11, 1612 at St. George. would not be outlawed until 1807 and all slaves would not be freed until 1834). However, a combination of poor governmental policy, insufficient cultivatable land and natural pests brought down the island’s tobacco industry. In its place cedar production became the main industry and ship building became important. A by-product of this was the development of the Bermuda sloop, which was very useful in commerce and in commerce raiding. Bermuda’s location not far off the coast of the United States has played an important part in its history. Prior to the American Revolution, the islands had traded extensively with the American colonies. However, when the Revolution came the Continental Congress declared an embargo of Bermuda that was so effective that a delegation of Bermudians traveled to Philadelphia to negotiate. While there was no official agreement, the embargo was lifted after gun powder from a munitions warehouse in St. George found its way onto American ships. 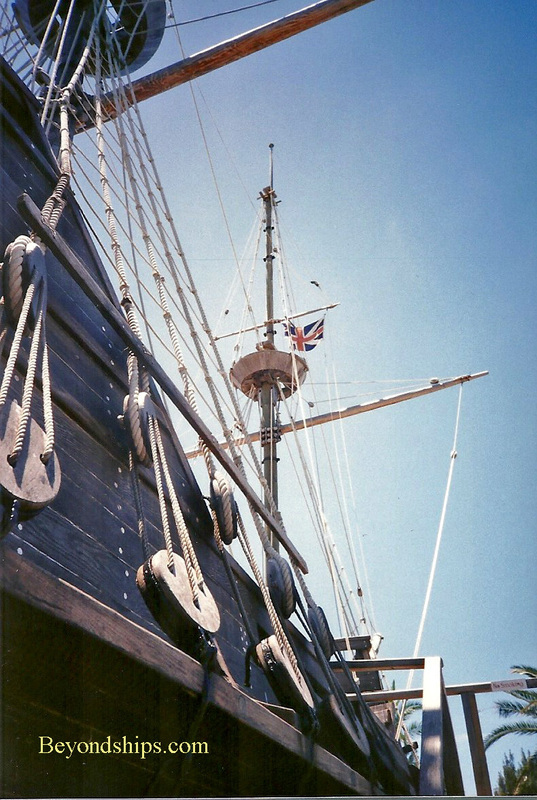 Still, many of the islands’ ships were used as privateers against American shipping. Due to its loss of the American colonies, Britain increased its military presence in Bermuda in order to protect commerce going to its Canadian and Caribbean colonies. The military build-up led to spending on the islands and the Bermuda economy prospered. stationed off the coast to prevent commerce with the rebels. The confederate ships were designed for speed and not for the rigors of crossing the Atlantic. As a result, Bermuda prospered as a transshipment point for cargoes from Europe that were loaded onto Confederate blockade runners. Bermuda was used as a base against German submarines in both World Wars. It also was used as a staging point for transatlantic convoys. In order to relieve it of the burden of protecting Bermuda, in 1941 Britain gave the United States a lease to establish military bases on Bermuda. These bases continued to operate until well into the Cold War. Bermuda’s airport is built on the former American air base. 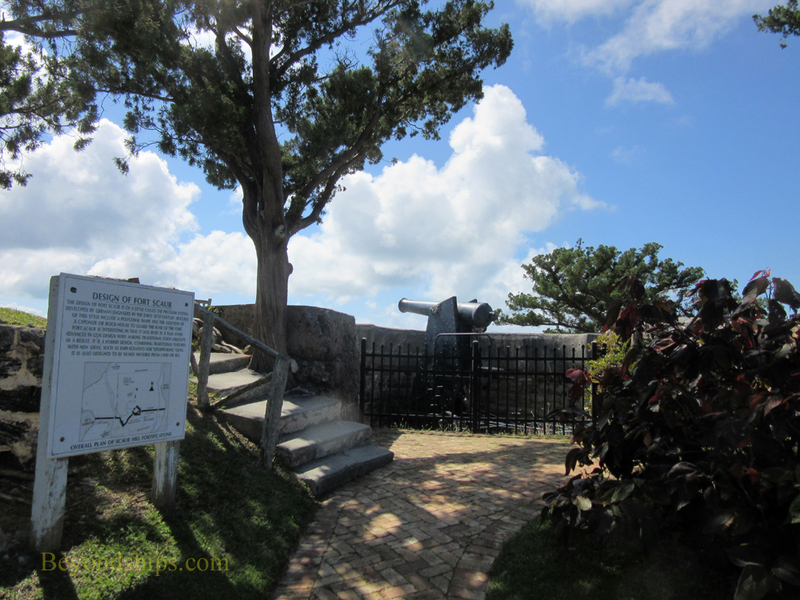 Queen Victoria's children, marked the beginning of Bermuda's rise as a tourist destination. She was followed by 19th Century American millionaires who came to the island to escape the North American winters. Bermuda, however, became a popular destination following World War II when cruise ship travel to the island grew. After jet airplane service was introduced, tourism again surged. Bermuda remains a British overseas territory. Although it became a self-governing colony in 1620 when its House of Assembly had is first session, a formal constitution was not adopted until 1968. A referendum on independence was defeated in 1995.